A quick post today - I wanted to share my take on holiday nails with you. I wear variations of red pretty much all year round and I am intentionally avoiding red polishes these days. I even wore a dark greyed blue (Essie Bobbing For Baubles) on the Christmas day. 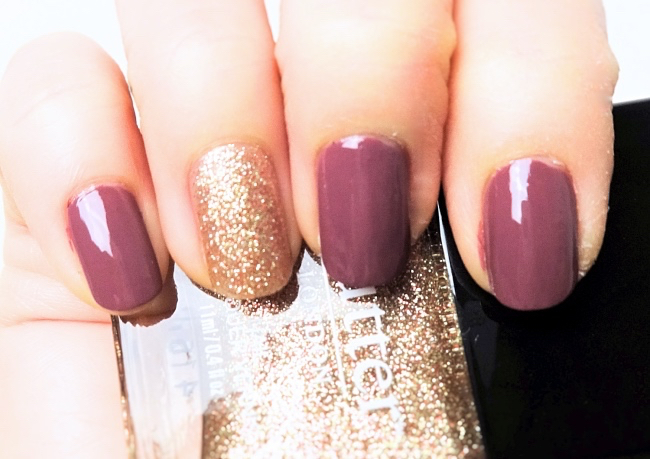 Butter London Toff is something I pull out once in a while especially in early autumn. This dusty mauve creme is uber posh but doesn't particularly scream "holidays". The pale gold glitter changes everything, though. I am wearing Butter London West End Wonderland on two nails only, and that is enough to put me in the mood for holidays. I applied two coats of both shades over Essie First Base Base Coat and added Essie Gel Setter Top Coat Polish. sooo pretty!! i love it!! i haven't done my nails in months!! you're making me wanna do a mauve creme color! Hahaha, I think it's frosted berries! So that's holiday, right?